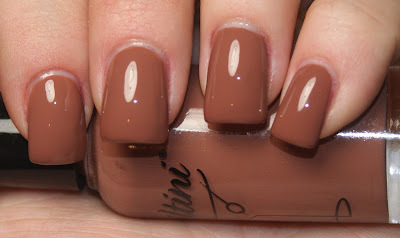 Today, I'm bringing you the newest collection of polishes from 'Tini Beauty's Nailtini brand! You may remember how much I loved their Cocktail Napkins (polish remover pads) from my last Nailtini post! I'm still obsessed and no one else is allowed to use them! And how adorable... it's called the Speakeasy Collection! The collection consists of two cremes and two glitters! First up in the collection is Dark and Stormy, a mauvy greige creme that screams mocha ice cream to me! It's like I just dipped my fingers in it! Yummy. Okay, for me at least! The application on this was perfect and the picture above features two coats of Dark and Stormy. That luster you see? Without any top coat at all. This is a perfect shade for those of you ladies out there who have workplace restrictions on manicures. It's rich and dreamy, but very office appropriate. And just so you know, a Dark and Stormy is a mix of rum and ginger beer with a lime wedge! Next up is another creme, Sidecar. Named for the mixture of orange liqueur, cognac, and lemon juice, this rich and creamy caramel is to die for. Seriously, forget the mocha ice cream. This is what happens when I make caramel apples and have too much left over for my own good. Molten caramel on your nails? All day? At home? At the office? Sign me up! With two coats, this polish also applied wonderfully. 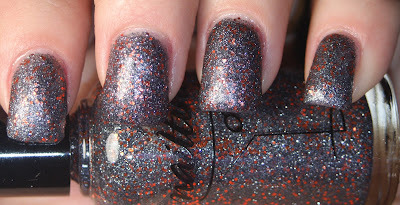 Rusty Nail consists of a ton of pewter glitter particles with chunks of larger copper glitter mixed in. As you can see, this dries with a matte finish. This is very Halloween, yet also very winter. It reminds me of fire and coal, like in a burning fireplace. It's definitely unique. This was with two coats of Rusty Nail, but you honestly could get away with just one. The polish was not gloopy or too thin, as many glitters are. It was just right. Fun fact: A Rusty Nail consists of Drambouie and Scotch! Last, but certainly not least is Millionaire. This was my hands down favorite of the Speakeasy collection. Millionaire is jam packed with rose gold micro glitter and bar glitter in teal and gold. It is so unique! You all know me pretty well by now. I'm not a fan of bar glitter. But this polish has sincerely changed my mind. It made me think of Christmas tinsel, so you know it's a great holiday shade. The above is with three coats, which I did to make sure the coverage was solid. I didn't have a problem with the distribution of bar glitter and got a good variety with every brushstroke. That's usually a major concern I have with other glitter polishes featuring a multitude of glitter types. But nope... this one hit the mark in a big way. Overall, I adored this collection. I'm not usually a person who loves brown, but I honestly could see myself wearing these. Additionally, Speakeasy is awesome for the Polished Professional, who loves to rock fancy nails on the weekends and muted colors on a workday. You could also do a french tip or stripe of Millionaire or Rusty Nail over any of the colors. I think you could also do one coat of Millionaire over Sidecar for a quick change of pace. It's really the best of both worlds. I also have to commend Nailtini on their improved formula. The Speakeasy Collection is available over at TiniBeauty.com. Each shade retails for $13, but is a pretty sizable bottle. And BONUS! Nailtini is also offering 10% off for all of you Princess Polish followers out there! Just enter the code NAILBLOG at check out and the discount comes right off of your order. Will you be buying the Nailtini collection? And are you also aboard the Millionaire train?